Vicious cycle of incentives in food delivery firms: How long will it last? 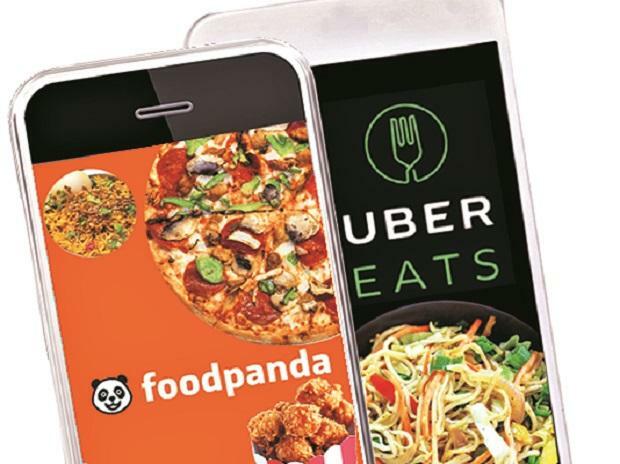 Online food discovery, ordering and delivery apps Foodpanda and Uber Eats, owned by cab aggregating giants Ola and Uber, respectively, spent almost $400 million in 2018 on rapid expansion as well as discounting to gain new customers, it is learnt. According to sources, the two companies are planning to make similar investments this year as they plan to diversify into grocery delivery services and finally set up concierge service by end of the year. Uber Eats and Foodpanda did not respond to detailed questionnaires sent to them. The duo have been fighting for the third spot in the food delivery ladder, with Uber Eats edging Foodpanda by 2 million orders. Together, they deliver 15 million orders a month. Market leaders Swiggy and Zomato deliver between 20 million and 30 million orders a month. While acquiring Foodpanda in December 2017 for around $50 million, Ola had announced it would invest $200 million in the firm. It has stuck to that promise. To take on Swiggy and Zomato, it has been burning cash to discount food and give higher margins to restaurant owners. A source in the company said Ola was following the same playbook with Foodpanda as it did in its early days as a cab aggregator — deep discounts. “The company’s goal, at present, is to get as many users and orders as possible. It has to take on Swiggy and Zomato,” said a former Ola employee. Foodpanda has been on a rapid expansion drive as well. With its expansion to 50 cities, Foodpanda’s delivery network is now the largest in the country, with more than 125,000 delivery partners attached to the platform. All of this comes at a price. The two foodtech unicorns burn much more than their mobility counterparts. But they have more depth in their food delivery arms and better built out internal solutions. “Rapid expansion as well as discounting cost money. Foodpanda is offering as much as 70 per cent discounts at times. They are paying the balance amounts to restaurants via which they are giving the offers. All this requires a lot of cash,” said a senior executive in Foodpanda’s marketing strategy team. UberEats has also turned up the discount volume in key cities. Foodpanda is also working on expanding its network of cloud kitchens, which is a capital intensive programme. It started this after it acquired Holachef last year. “Setting up central kitchens is always a capital intensive measure. The kitchens have to be equipped, chefs and support staff need to be hired and delivery logistics need to be installed around the kitchens. All this has been a major expenditure for Foodpanda,” said the source. Along with this, Foodpanda also made large hires and stepped up restructuring in its existing workforce. All in all, it meant spending a lot to make the company competitive in the current landscape. 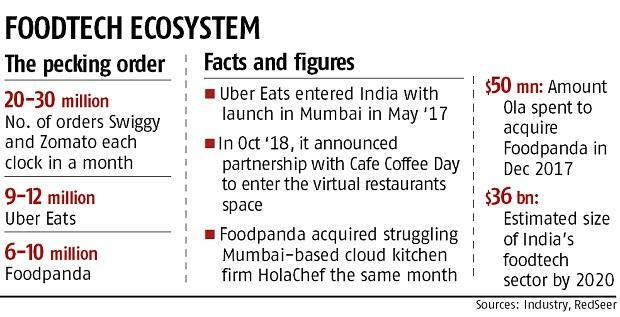 On the other hand, UberEats, which was launched in Mumbai in May 2017, has been spending on adding cities and creating the network for its grocery delivery initiative, which it plans to start this year. Now present across 37 cities, it is also spending a fair amount on marketing to acquire customers either through discounts or outdoor ads. This year, the company will also expand its network of virtual restaurants in partnership with Café Coffee Day. Last year the two firms partnered to launch ‘delivery-only’ restaurant brands exclusively on the Uber Eats app. The company has been running a pilot since November last year and will expand on the programme.